As a busy mom of two of the sweetest lil' cupcakes in town there's little time for luxurious trips to the spa. In between wiping sniffly noses and learning the latest dance moves courtesy of my 7 year old, I make some me time after they've gone to bed by pouring myself a cup of tea, rifling through my subscriptions of fashion magazines, a sensuous bubble bath and the alluring glow of Chesapeake Bay Votives to illuminate my personal spa retreat. With captivating scents like Honey Lemon Creme, Lily Orange Blossom and Amber Vanilla Hazelnut you too can create a min-spa sanctuary at home. 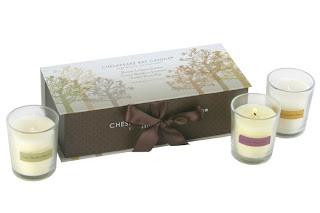 Chesapeake Bay Candle products are perfect for entertaining, romantic evenings, relaxing solo, excellent travel companions and make memorable gifts . The luxurious candles are made from soy wax for sustainability and a cleaner burn, feature 100% cotton, lead-free wicks, and are hand poured by skilled artisans. 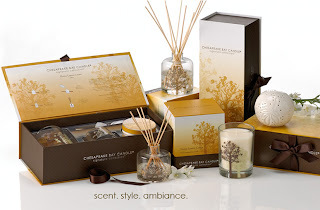 The stylish glass and packaging of the Chesapeake Bay Signature line are designed to be re-used. Today, with the economy is such shape as it is many buyers are turning to the Internet to shop from the comfort of their home instead of using up their gas budget going from mall-to-mall. The Internet offers them the chance to browse through various on-line stores with-in minutes. Many stores with an on-line presence are offering greater deals since it cost them much less to bring their specials to you. Additionally, they are offering coupons for you to print that are good for in-store specials. With Valentine’s Day fast approaching many people are stuck in-doors because of the winter weather and turning to the Internet for their shopping. A new Valentines Day specialty Internet shopping experience has just opened to bring you a wide variety of gifts for that special someone at very reasonable prices. Guys, if you’re not sure what to get that special someone there’s the perfect solution for you with the downloadable eBook His Guide To Her Jewelry that will guide you through the minefield of finding that perfect gift for that special person in your life. For those folks that find themselves stranded with no special someone or even those that want to spend Valentine's Day alone the new Free downloadable eBook Surviving Valentines Day On Your Own is available to make Valentine's Day special for you.